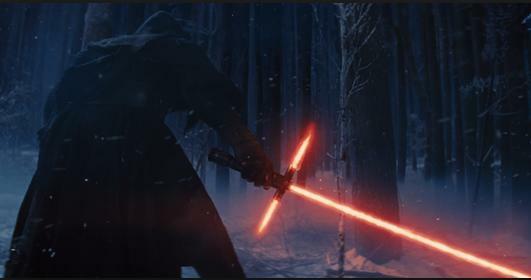 We know that he wields perhaps the most unique lightsaber ever seen in the Star Wars universe. We know he will played by Adam Driver. We know that he is probably the heir apparent to the Dark Side of the Force, filling the void left by Darth Vader and Emperor Palpatine/Darth Sidious, but Kylo Ren, like so many aspects of Star Wars Episode VII: The Force Awakens, is shrouded in secrecy. Director J.J. Abrams is still keeping the good tidbits of information about the upcoming film hush-hush, but he opens up-just a little- about how Kylo ties into the Star Wars franchise; how he is described as a Darth Vader “groupie,” his alliance with General Lux and The First Order and The Knights of Ren. The movie explains the origins of the mask and where it’s from, but the design was meant to be a nod to the Vader mask, [Ren] is well aware of what’s come before, and that’s very much a part of the story of the film. Abrams hints that Kylo could be an inverse of Luke Skywalker, whose character will still hold significant influence in The Force Awakens and perhaps Episodes VIII and IX. According to Abrams, Kylo designed his lightsaber to match his own characteristics: dangerous, fierce and ragged.